Maggie is a six year old tri colored Aussie. She is a Velcro dog and that is a good thing. 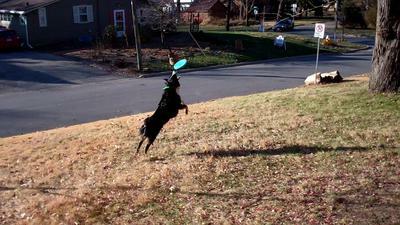 She is proficient in tennis ball, Frisbee and agility. 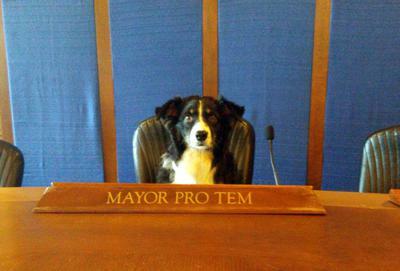 Maggie is also a certified Therapy dog registered with Therapy Dog International. Every other Sunday Maggie and I go to a group home administered by the MOSAIC folks. The group home is home to folks with physical and mental challenges. 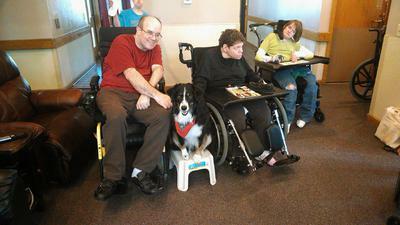 They look forward to our visits and we always have a great time filled with smiles and love. One of Maggie's best tricks is that she can balance a tennis ball on her nose and hold it there for an extended time and when she is given the Que of "OK" she can roll the ball off her nose and catch it in her mouth. Maggie is the sweetest girl in the world and wants to be everyone's friend.